Can inexpensive and quirky Trinidad attract a new wave of Colorado creatives? The state, and a growing community of artists, say yes. Twenty-one miles from Raton, New Mexico, Trinidad, Colorado, sits smack-dab in the middle of the high mountain desert between Denver and Santa Fe -- 200 miles in either direction. As the southernmost stop on I-25, Trinidad is experienced by thousands of motorists every day as a blur of brick and stone, a charming blip on the way through Las Animas county on the way to somewhere else. But up close, Trinidad comes into focus as a hybrid of worlds. Industrial and arty, historic and hilly, it feels a bit like an Italian artisan village set in the old West. The brick-lined streets are often uneven. 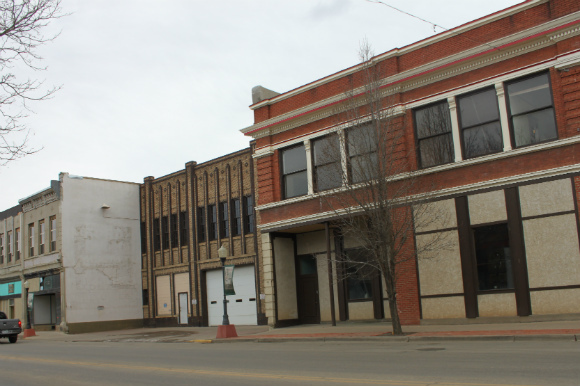 Gorgeous old masonry buildings sit ornate and, often, empty in the historic downtown. Freshly painted murals share wall space with the ghostly outlines of signs for drugstores and furniture makers long gone. It's a strange place, both edgy and homespun, which is one of the reasons why a growing community of artists from Colorado and beyond now call it home. 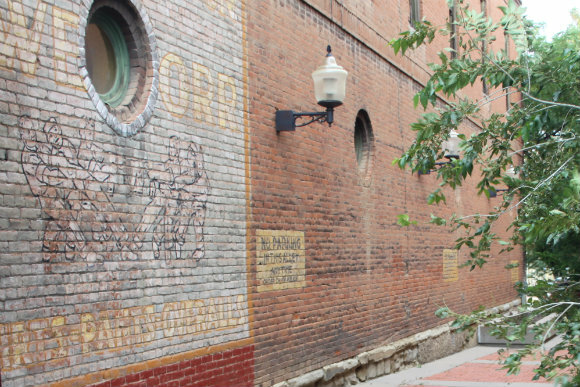 Ghost signs decorate the bricks in downtown Trinidad. The other reasons? For starters, Trinidad is affordable and accessible -- a pleasing combination for the 100 or so artists who live and work there full-time, many of whom have fled rising costs in more established and gentrified "art" cities, including Denver. In Trinidad, big, beautiful houses can be found for $100,000 or less. A nice dinner with wine runs about $20. And in the connected world of online galleries, publishing houses and media platforms, it's possible to show and sell work to anyone from anywhere. If you have a way to bring in some money, you can live and work pretty comfortably in Trinidad. "It's expensive to be an artist," said Rodney Wood, director of the Trinidad's popular ArtoCade Festival. Wood moved to Trinidad in 2012 after touring the country in search of an artist-friendly place to live. "I moved to Santa Fe in the '70s because it was cheap, if you can imagine that. The golden rule, especially for young or emerging artists, is to keep a low overhead. If you don't, you're going to spend all of your time and energy paying for your house, paying for your rent and maybe three hours working on your art." He learned long ago that living in a trendy zip code was at odds with his work. "You have to make some sacrifices for your art," adds Wood, who owns a huge live-work space on Main Street -- the kind that would fetch seven figures in today's RiNo. "If you're not doing that, you're making art to pay your mortgage. And that's about the least interesting thing you can do." Hans Droog is an artist and illustrator, originally from the Netherlands, who moved with his partner to Trinidad after 25 years in St. Louis, Missouri, after driving across Colorado. "We attended the First Friday Gallery opening night in Trinidad, and there were people telling us exciting new promises in the arts world," says Droog, 58. "We decided that Trinidad, a small town with affordable housing, was a good place for us to start." Droog "threw himself in" to the local art scene; just three months after moving, he's already had a gallery show. "One of the reasons I decided to move to Trinidad was the fact that this town needs help with new blood," he says. "Here you can be a part of something new, as opposed to big, established cities where you just get drowned out by the crowds of artists and people. We can get involved in helping this city getting a hold on a developing art scene." Droog is exactly the kind of new resident Trinidad believes will breathe life and economic vitality into this former mining town, which has boomed and busted in cycles for generations. The population has struggled since peaking at 16,000 in 1940, at the height of mining activity; today, it's 8,200. The legalization of marijuana has been a lifeline, albeit a controversial one, with seven dispensaries that serve both locals and tourists. The city's marijuana industry generated more than $800,000 in tax revenue in 2015. Trinidad's assets -- clean air, proximity to big cities and airports, a temperate climate, inexpensive housing stock -- have long been a draw for those seeking a vibrant but small community. Now, in more intentional ways, they're being packaged to attract new, creative blood. 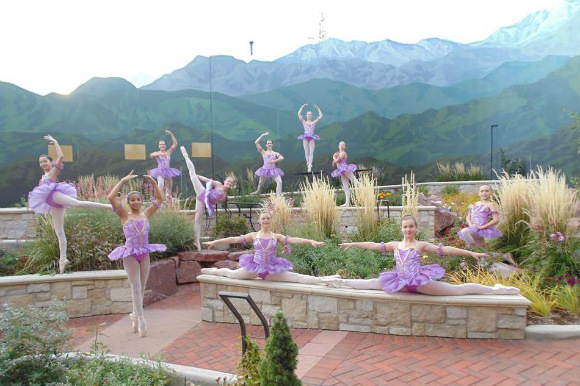 Ballerinas dance in front of a mural along Trinidad's Purgatoire River. 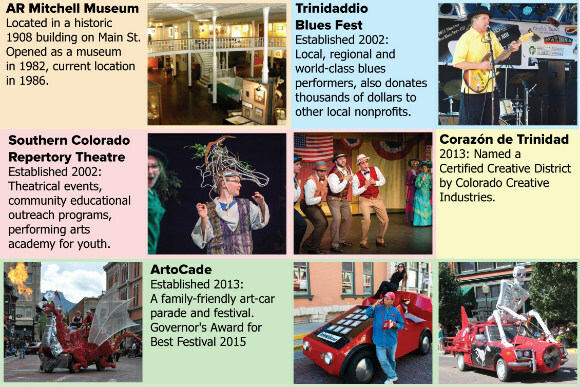 In 2013, the historic Corazón de Trinidad was certified as a Creative District by Colorado Creative Industries, a designation that provides a platform of support for individual creative artists, entrepreneurs and businesses, as well as local government. And last year, Trinidad was selected as the first city in the state's Space to Create Colorado initiative, which aims to make it easier -- and cheaper -- for artists and entrepreneurs to open creative studios and businesses in Trinidad. "Trinidad was selected as the demonstration project for Space to Create Colorado because of its unique architecture, history and concentration of artists and creative workers," says Margaret Hunt, director of Colorado Creative Industries. In fall 2017, an entire block of historic buildings on Main Street will open to emerging and established painters, sculptors, writers, designers, photographers, bakers, brewers and entrepreneurs who meet a range of criteria. The now-empty buildings, which include a former fire station and a bank, will be renovated and refitted as affordable live/work spaces. Planners hope to build in a public event space, a community kitchen and temporary housing for traveling artists. The Space to Create block in downtown Trinidad. Space to Create Colorado, the theory goes, will nurture and grow the existing creative community in Trinidad, which has rallied mightily behind the initiative since it was first proposed, as has the business community; a local bank, for example, donated one of the three buildings that will be converted for Space to Create housing. It is also designed to cement Trinidad as a destination for cultural tourists, who eat, spend and sleep at local restaurants, shops and hotels, feeding an upward spiral of economic growth. "When we first moved here 16 years ago, buildings were boarded up, houses were empty. It was a kind of a sad, dreadful place," says Marilyn Leuszler, chair of the Corazón de Trinidad Creative District. "Now, the difference is almost palpable over the last few years. We've gone from a somewhat depressed state to one of enthusiasm and anticipation of better things happening and coming. That's a huge change." Leuszler says Space to Create has increased Trinidad's appreciation of the arts as an economic driver. "They understand that this is sound business," she says. "This will bring more tourists, more restaurants. They will demand broadband and high-speed Internet. It's not just people running around with paintbrushes." In 2016, the City of Trinidad increased funding for the Trinidad Arts & Culture Advisory Commission from $4,500 to $45,000. CCI's Hunt notes that Space to Create Colorado has already spawned investment in the district. "Other investors have acquired other historic buildings in town and are aligning their vision for development with the vision for Corazón de Trinidad," she says. Trinidad has a lot of the same stuff you find in any well-preserved old town: Shops and galleries that trade in Western-style watercolor landscapes, pottery and turquoise jewelry. Bronze sculptures and commemorative plaques that mark important buildings. A museum that recounts the hardships of early trappers, traders, settlers, fighters, soldiers, barons and coal miners. Rodney Wood is excited by what he sees as an embrace of Trinidad's quirky past and present. It's part of what attracted the artist and Colorado native, who moved to Trinidad in 2012 after spending decades in the art-world establishment. Soon after Wood got to town, the local tourism office hired him to create an outdoor festival that would generate tourism and publicity. 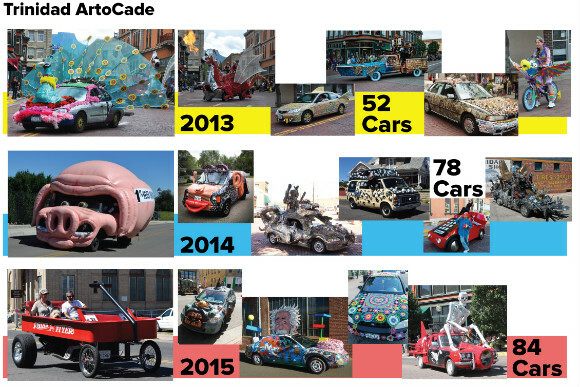 The following year, he launched ArtoCade, a festival of "art cars" that brought 4,000 makers and fans from across the country. 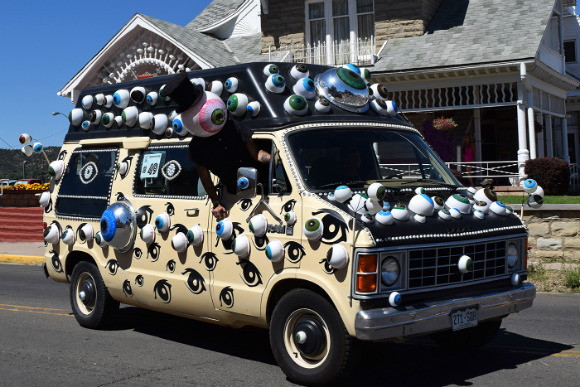 Now the second largest art-car festival in the United States, ArtoCade attracted nearly 9,000 people in 2015. Trinidad's annual ArtoCade is the second-largest art-car parade in the U.S. In late 2016, Wood will open The Bizarre Car Garage museum in Trinidad, anchored by four works by the art-car star Rebecca Bass. It will soon be joined by a Drop City Museum, currently in the planning stages. "Trinidad's time is potentially coming," Wood says. "I'm trying to get everyone to embrace the oddity of this place. You have to embrace who and what you are. That's how you have true cultural impact. "One of the things I'm loving is the influx of young people," he says. "The arts community is hungry for some variety. At first they're baffled and then inspired by it. When we've had shows here that have not been 'normal' -- some showing even technical things that they'd never seen before -- people were fascinated. They were amazed that people made art that they knew were not going to be marketable. It was an instant expansion of consciousness." Artist Hans Droog agrees that Trinidad is benefiting from new people, new perspectives, new skills. "Every week I meet new very talented people here, in the music world, theatre and other visual artists," he says. "I did not expect to find so many, very unique, very talented people. I think this area will offer plenty of inspiration with the people, the weather, the environment for me to continue my work as an artist. I'm excited to know that being here will make a difference for me and the art scene here in Trinidad." The influence of a new wave of creative life in Trinidad can already be felt around town. At the Carnegie Library, the works of Matthew Ferolie, a distinguished painter who returned to Trinidad in 2014 after years in New York City, hang on the art wall, where works by local artists rotate monthly. Pinned to a community bulletin board at The Cafe, one of a few places in town to serve cappuccino, are flyers for woodworking classes, sound healing and performances by the Southern Colorado Repertory Theatre. Voices, a new literary coalition led by educators at Trinidad State Junior College, hosts events for writers and readers. 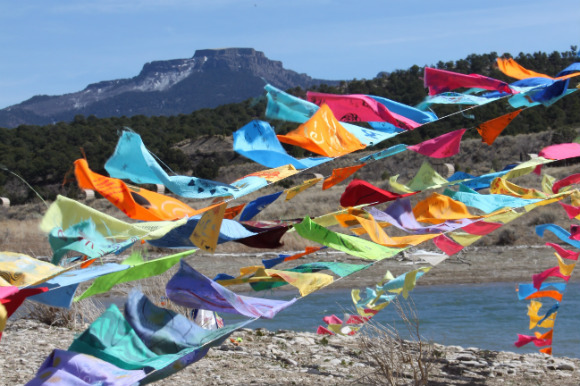 In March, the group brought in Wang Ping, a Chinese-American writer and artist who worked with the community to create prayer flags that will eventually be hung in the Himalayan Mountains. It's all different -- and all very of the moment in Trinidad. "Nobody wants to emulate another successful place," says Corazón de Trinidad's Leuszler. "We don't want to be another Taos or Santa Fe. And even if we did, it would be impossible. Trinidad has such a varied and very interesting history. People just want it to be successful again as what it is, and to find out what is possible." 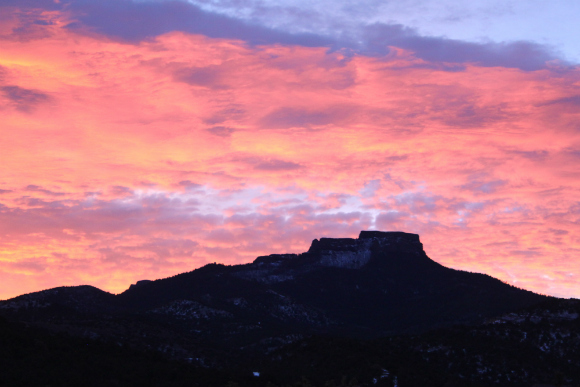 The sun rises above Fishers Peak near Trinidad. Photos courtesy Corazón de Trinidad. Six years ago, Rodney Wood drove across the country with his soon-to-be partner, Susan Palmer, trying to decide where to live. A painter, sculptor, curator and educator, Wood had lived in places known for arts culture: Santa Fe, San Francisco, Sedona. Like Palmer, also an artist, the native Coloradan was looking for an affordable, interesting community with some like-minded folks. He found it in Trinidad. Wood, 65, is the founder and director of ArtoCade, a parade and festival that brought 9,000 people to Trinidad last year. He is also the city's semi-official ambassador for art. From his live/work studio on Main Street, he waves to everyone who walks by -- while helping to imagine and build the future of one of Colorado's most unique creative districts. Confluence Denver: You've lived a lot of places. Why Trinidad? Rodney Wood: We moved here because it's not yet thriving, but it's not dying. It's still got hope. You drive all over, you see, wow, there are a lot of towns that are completely dead. Like Port Arthur, Texas. It's three times the size of Trinidad. A ghost town that's never ever going to be fixed. You could make it a post-apocalyptic theme park, but that's about it. In Trinidad, you can buy a house for $50K. There's a sense that we're on the early end of a change. Most of the rest of the I-25 corridor is "done" except for Trinidad. We're the last town on the line. We're in this transitional phase after the loss of the coal-mining industry; anything can happen. A lot of artists and development-type people are sniffing around. For me, the main reason to be here is freedom. CD: You keep very busy here, with ArtoCade, among other things. RW: I came here without having any idea that I would be in charge of an art car event, but here we are, going into the fourth year of the actual festival. The city has been wonderfully supportive of my madness. Parades here typically go in a straight line. I wanted to go in a circle. I said, "Here's all the streets I want to block off. Parking is going to be a nightmare." The people at the city said, in unison, "Wouldn't that be great? To have a parking situation in Trinidad?" CD: Why do people get excited about art cars? RW: The art-car movement is all about expressing yourself. We try to be inclusive while also encouraging art is that is actually good. There's a huge community of art car makers all over the country; we see people from Texas, Seattle, California who make just incredible stuff. CD: And the town has responded? RW: It's not just a parade and then everyone goes home. Afterwards they all stay on Main Street. We have booths and activities and a party. It's a photo-op-a-thon. They say, "What? Is that car completely covered in cigarettes? Is there an actual car under all of those mannequins and stuff?" We have an event that includes kids, quilter and convicts. [Two years in a row, Wood created art cars with groups of inmates from Trinidad State Prison.] People here get really into it. You drive around town now, you'll see cars that are painted, covered with beads, mounted with stuff held on by magnets. These are people who say, "Oh, I'm not an artist. I just wanted to be part of this." I'm like, "Okay. You're not an artist. Fine. But that's a beautiful car." ArtoCade, which won the 2015 Governor's Award for Best Festival -- Small Town, will take place Sept. 9-10 in 2016.